Cut the garlic cloves into extra small bits. Slice the spring onions into thin rings. Cut the tomatoes in two horizontally. 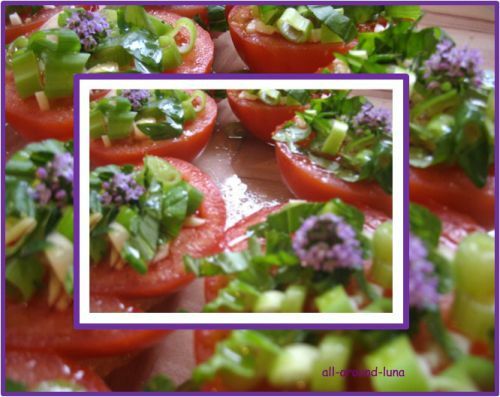 Arrange the tomatoes inside up on a large oven dish. Sprinkle with garlic, chopped rosemary and thyme. Add the spring onion. Sprinkle with salt & pepper. Pour some olive oil on top then sprinkle with breadcrumbs. Cook in the oven for +/- 15 minutes. Tomatoes must be soft but not dissolved.